Before Kingdom Hearts, there was another time that Square created a strange hybrid RPG with action elements! I first played this with my sister and another kid who lived across the street, and we got almost to the end. If I remember right, we nearly stalled out in the volcano and then couldn't beat the Smith Gang when we went on to the final boss, which strikes me as almost unbelievable now that I'm replaying through. Was I ever that bad at video games? Is my memory just bad and we actually won? Well, I won this time. 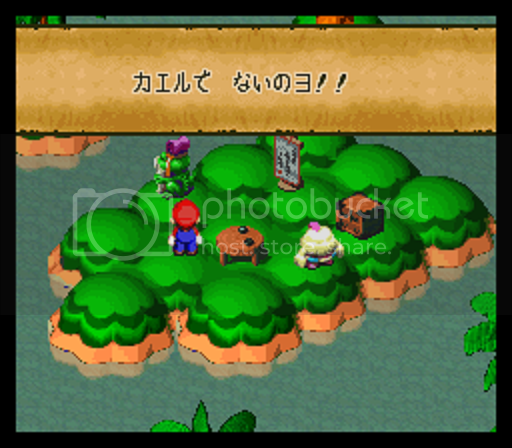 Super Mario RPG is the story of Mario and KoopaBowser. Peach is visiting Mario at his house when Bowser shows up and kidnaps her, leading Mario to go to his castle--which is apparently a mile or so from the Mushroom Kingdom--and the two continue their eternal battle. Then a gigantic sword descends from the heavens, shattering the Star Road and plunging into Bowser's Castle. When Mario returns the sword speaks to him, saying he's a member of the Kajiō Army (Eng: "Smithy Gang") and that the castle is there's before destroying the bridge, and so Mario begins his quest to get Princess Peach back. Of course, a quest needs allies, and Mario quickly finds some. In the Mushroom Kingdom he meets Mallow, the son of the Frog Sage (Eng: "Frogfucious") who is white and fluffy, like a frog; round and slightly clumsy, like a frog; and makes it rain when he cries, like a frog. Soon afterward in Rose Town, the duo are joined by Geno, a doll inhabited by...well, by an angel--when he goes to fight Yuminpa (Eng: "Bowyer"), he introduces himself with the line “ボクは、　天空の使者！そして星を追う者！！" ("I am the messenger of Heaven! The one who chases the stars!"). This is where Mario learns the true danger of the Kajiō Army. Their arrival shattered the Star Road, and without collecting the stars and rebuilding the road, no one's wishes will come true! Disaster! 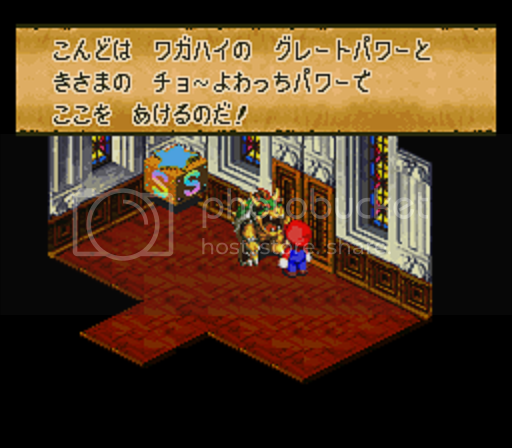 And then, outside Bukki (Eng: Booster)'s Tower, he meets Bowser. Bowser has been abandoned by his army and despairs of getting his castle back and now even his beloved Princess Peach has been stolen away from him, but seeing Mario, he agrees to a temporary alliance and joins the partyinducts Mario into the Koopa Army. 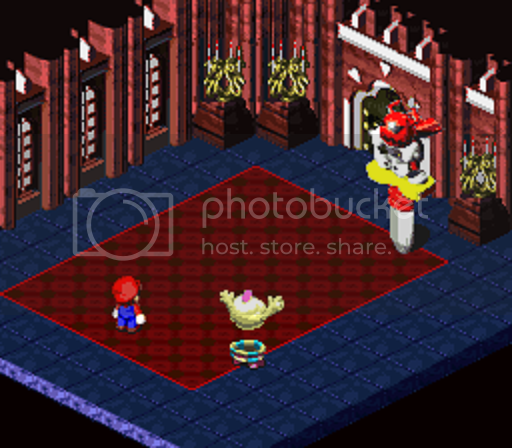 After climbing the Tower and chasing Bukki down, Mario returns Peach to the Mushroom Kingdom and explains his mission to save the Star Road, so when he leaves the castle, Peach comes along with him. And with those five members of the party, the quest to save the Star Road really gets underway. Spoiler alert: the white cloud thing is not a frog. Kind of surprisingly to me, it's the character interaction that makes the game. Mario is the classic silent protagonist of the area, but to make up for that he has a surprisingly strong command of pantomime, to the extent of being able to transform into other characters to explain the destruction of the Star Road, meeting Bowser, Geno's appearance, and anything else necessary. Geno doesn't have much personality other than being the strong warrior of heaven, and while Peach has the most feminine speech patterns of any protagonist in a game I've played, she doesn't actually have much to say once she joins the party. It's Mallow and Bowser that are the stand-out party members. Mallow is someone I didn't appreciate at all as a child but which grew on me while playing as an adult to the point where he's my favorite character in the game. In the beginning he worries a lot about being a 泣き虫 (nakimushi, "Crybaby"), and when Mario goes to fight Yuminpa he runs behind and says that even though he's weak, he'll be cheering Mario on from the sidelines before tripping and falling. 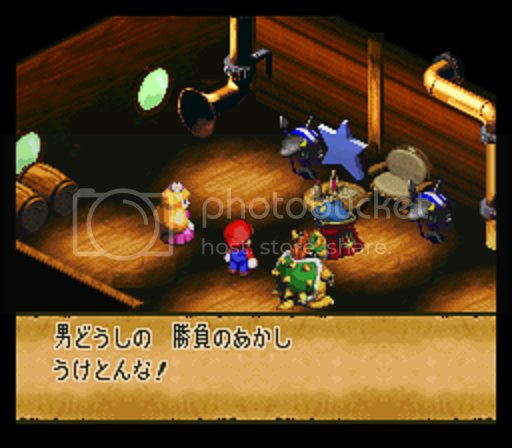 He looks up to Mario as a great warrior and as he travels, he becomes braver and braver, until by the end he's standing in front of Kajiō and demand that he turn over the last star piece. There's an attitude in Japan that softlykarou has commented on before about failure and effort. I don't want to overplay it, since I'm positive this isn't true in the workplace, but there's often an attitude that the important thing is trying one's best and the results are secondary. We say that in America too, but here it's almost always a lie, and in Japan it's only frequently a lie. Mallow shows the good side of that attitude, where he starts out in the shadow of Mario but, in the course of their journeys together, he comes into his own. He's really the only character who has an arc--Mario doesn't talk, Geno and Peach don't say much and Bowser is funny but static, but Mallow grows. It makes me sad he was never in another game. "Next time, with my great power and your pathetically weak power together, we will open this door!" Bowser also ends up a star player. Every game before this, he's been an uncompromising enemy of Mario--well, unless you subscribe to Miyamoto's explanation that it's a play, they're a sort of actor, and that on weekends Mario, Peach, Toad, yoshi, Bowser, and all the rest get together to play golf or tennis and race go-carts--but here he's a party member, and one of the better ones. Once he was available to me I kept him in my party for most of the game, since you can switch party members at any time and there's no worry about missing out on dialogue based on who is in the party. He has his pride. He certainly won't join the party, since that would imply that he is under Mario's authority. 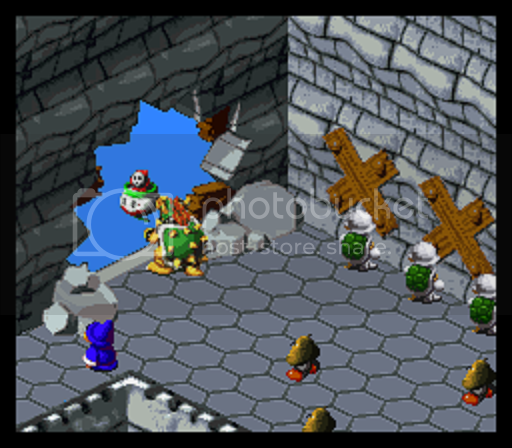 Instead, he graciously inducts Mario and his friends into the Koopa Army with the goal of retaking his castle. He repeatedly uses "wagahai" as the pronoun to refer to himself, which is hard to tranlate but is a bit like using the royal We (including the connotations of arrogance), and throws it in about three times as often as would sound natural in Japanese just to emphasize how important he is. He talks about his "great power" as opposed to Mario's "weak power" and tries to smash down any door that stands in their way. And then, after the "Koopa Army" retakes his castle, he balks at going after the Kajiō Army because he has what he wants. He's not deep, but he was well-written and funny. He's exactly what I imagine Bowser to be like. Manly bonding through battle with a (shark)Man of the Sea. The secondary characters are fantastic too. The Mushroom Kingdom's chancellor talks like a Tokugawa Shogunate-era noble and is full of dignity, but then when Mario goes to check on the bridge to Bowser's Castle and is gone for maybe twenty minutes, he comes back to find the Mushroom Kingdom has been conquered by shyguys on pogo sticks and the chancellor is cowering in a corner. The shyguys themselves show up in multiple places and they're always very cheerful, from the shyguy who holds up the chandeliers in Bowser's Keep and is apologetic about the possibility of throwing Mario and his friends off to their death to the shyguy who waters the piranha plants in BeanBean Valley and sings to itself while it works. I also have to throw some confetti to Kino and Nancy (Eng: "Raz" and "Raini"), a couple of young mushrooms in love who Mario and friends run into multiple times in the first half of the game. Eventually they all simultaneously arrive in Merry Marry Town (Eng: "Marrymore"), and after Mario defeats an evil wedding cake and rescues Princess Peach, Kino and Nancy get married. If you want, you can go to Yo'ster Isle afterward and find them on their honeymoon! The wishes on Star Hill, with Luigi's wish that he can be useful to his bother. Jonathan Jones the shark pirate who hands over the star to Mario because he respect's Mario's battle prowess. Belome, the weird genius loci who has his own temple and only wants to eat and eat and eat. The mouse who is returning to Monster Town through the wilderness and gets very cross when Mario jumps on his head. It's almost like Earthbound in its cute, quirky, memorable characters. I don't even remember this one's name. Sword Pogo Guy! Sadly, the same is not true of the villains. This is no SNEs-era Final Fantasy with a single villain that haunts Mario throughout the game. The Kajiō Army is represented by a punch of living weapons who show up once and then are defeated, with no build up and no follow-through. What's more, the game doesn't set up Kajiō's goals or motivations at all until the very end, after multiple no-context boss fights that drain the player's goodwill. By the time I ground through all the fights and finally got to Kajiō, I didn't care anymore. I just wanted the game to be over. What's worse, the game doesn't even introduce Kajiō until the last half an hour or so. For most the game, you're led to believe that Kajiō is the giant sword that felt from the sky and pierced Bowser's Castle, but in the boss fight with him his name is Caliber (Eng: "Exor") and then Mario is pulled into the World of Weaponry (Eng: "Factory") and at the end is Kajiō. Sure, it's Square traditional to have a final boss out of nowhere with no warning--see also Zemus in Final Fantasy IV--but that doesn't mean that it's good. It just contributed to my dissatisfaction with the ending. Honestly, there's no real resolution either. I think the best thing to do is to play through and beat Caliber and then quit the game. All the fun character interactions are already over and what's left are just jumping puzzles and boss battles. 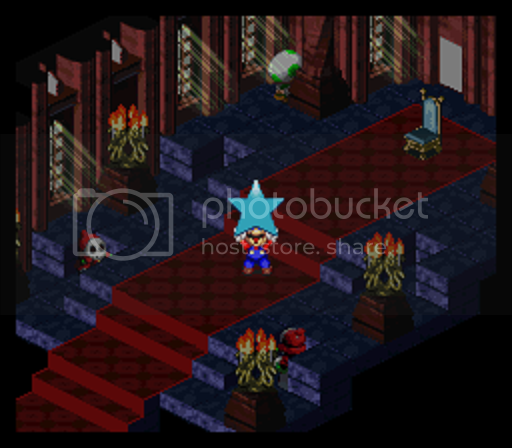 At the time, I remember thinking that Super Mario RPG looked amazing. It had three dimensions! 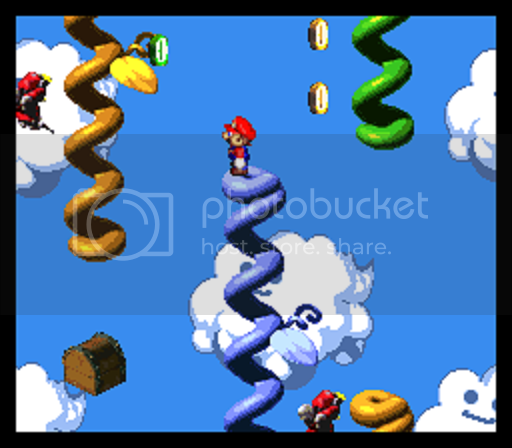 Mario can move all along the ground as well as jumping, and there are pits, floating platforms, and other mainstays of the Mario series. When I first played this in the 90s I was astonished at how good it looked, but like almost all early 3D, it does not hold up today. Compared to the clean pixel work of the SNES Final Fantasies, or even of Super Mario World, it's often a bit muddy and indistinct. Geno is a doll with a curl of orange hair, but kudos to you if you could figure that out from any of the in-game pictures of him. And like most early 3D platforming that isn't Super Mario 64, this is not a good platformer. It's hard to tell exactly where Mario is, exacerbated during the platforming near the end of the game where a single mistake sends you back to the beginning of the room. I'm glad that most of the time the platforming is just used for traversing the landscape and allowing 3D terrain rather than forcing tricking jumping across rooms full of lava, because otherwise I would have been much more than mildly annoyed. There are secrets available by jumping as well, like the hidden chests with frog coins or secret items, but almost none of them are necessary because the game is incredibly easy. There's an attempt by the game to force the player to pay attention with timed attacks and defenses--pressing the button at certain times during regular attacks or when attacked respectively increases or reduces the damage, and all of the special attacks have button combinations that need to be used. Sometimes you need to rapid-fire press the button, sometimes you need to hold the button for a certain amount of time, sometimes you need to press the button at exactly the right time. There are no fighting game-style button combinations, much to my surprise. Most of this was pointless to me. All of them were unnecessary in random battles after the first hour of the game, and while I used them in boss battles, I probably didn't need to. Once I got Peach in my party and got her the Fat Koopa Shell (Eng: Lazy Shell), she could just heal to her heart's content without really having to worry about incoming damage, and battles were not a threat from that point forward. If anyone died, Peach could get them back on their feet. Mario did enormous damage with his own Lazy Shell weapon, and nothing was dangerous. Not even Culex, the secret boss who crossed the barrier from two-dimensional Final Fantasy land seeking the power of three dimensions. By the end, I was mostly just fast-fowarding through battles so I could get to the next conversation. That was the good part. Everything is back to normal, until next time. No thanks to shyguy. 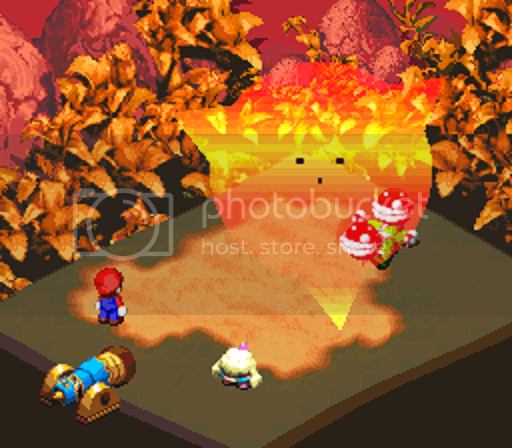 And that's why I'm a bit hesitant to recommend actually playing Super Mario RPG. Watching a playthrough, absolutely. The story isn't deep, but it is engaging and cute, with a lot of fun side characters and great interactions between the party members. But the battle mechanics are deeper than the difficulty has any requirement for, and while the jumping mechanics were novel at the time, now they come off as quaint at best and infuriating at worst. I can see why the mechanics were simplified even further in the Paper Mario games--on their own, Nintendo realized that the complications weren't necessary. Also, I think it's criminal that Mallow, Geno, Booster, and the other characters introduced here remain stuck in IP hell and have never been reused. Okay, Geno gets a cameo in another Mario game, but Mallow is the best! How come there's no Mallow platformer? "Mallow: Prince of the Marshmallow Kingdom"? I would definitely play that! But, it doesn't exist. Tragedy.